Sonnenberg Gardens & Mansion State Historic Park is happy to present their ever-popular autumn live-whodunit-theater event, Mansion Mysteries, on October 16-18 & 23-24. 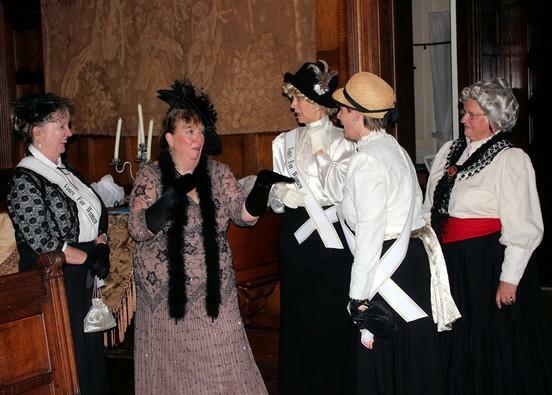 This unique event allows attendees to enjoy a live theater performance in one of the region’s most recognizable historic landmarks, the Victorian mansion at Sonnenberg. The play, A Fowl Deed, was written by Joanne Vanderven and it features a fictional mystery interwoven with pieces of real Sonnenberg history and personalities. It is approximately 90 minutes long and the audience is invited to take part in the mystery by interviewing the actors and then casting their votes for the guilty culprit or culprits. The Friday and Saturday night Mansion Mysteries performances start at 7 pm and will be held on October 16, 17, 23, and 24. Due to this event’s overwhelming popularity, a Sunday matinee on October 18 at 4 pm has been added. Gates open 30 minutes prior to show time and guests will be taken via tram service to the Mansion where the performance will take place. Light refreshments, hors-d&apos;oeuvres, and desserts along with a cash wine bar will be provided. Non-alcoholic beverages are also available. Guests are welcome to more fully immerse themselves in the event by dressing in period costume if they wish. Tickets for the shows are $24 for Adults and $20 for Sonnenberg Members and Youths (ages 12 – 18). Advance reservations are required as seating is limited and the shows will sell out prior to the event. Reservations should be made by phone at (585) 394-4922 or online at www.sonnenberg.org. Sonnenberg Gardens & Mansion State Historic Park is one of America’s longest surviving estates from the Victorian Era. The elegant Queen Anne-style mansion was built in 1887 in Canandaigua by New York City financier Frederick Ferris Thompson, and his wife, Mary Clark Thompson, as a summer home. Between 1901 and 1920, the widowed Mrs. Thompson and her staff created the nine formal gardens seen today. The grounds are open to the public from May 1 through October 31 each year. Sonnenberg is a non-profit organization dependent upon the support of members and sponsors and its dedicated corps of volunteers.